Cover painting by Jean-Luc Guionnet. 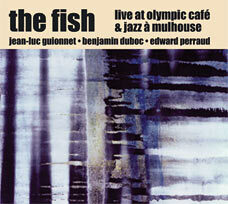 The Fish is a legendary French trio in the free jazz idiom. Here is the trio documented in two remarkable concerts in 2005 and 2006. The first is from the basement of "Olympic Café" in Paris and the second is from the Mulhouse Jazz Festival. The music is full of joy and energy all the way and it will never stop thrilling us with its freedom from harmonic frames and themes – free jazz when it is at its best.